Australia is known as 'the lucky country' and it's not hard to see why with Whitsundays holidays at the top of many travellers 'bucket lists'. 150 km north of Mackay and 300 km south of Townsville the stunning Whitsunday Islands are set at the heart of the World Heritage Listed Great Barrier Reef. This unique part of Australia is an exotic and breathtakingly beautiful destination that showcases Mother Nature at her absolute best. This natural wonder will remain in your memory long after your holiday is over and with direct flights departing daily from most cities and a wide range of accommodation for all travellers and budgets, the Whitsundays are a must see holiday destination. Whitsunday accommodation is as diverse as the islands themselves and the region is home to a wide range of resorts and hotels on the islands as well as along the coast and on the mainland including Airlie Beach. Accommodation options range from charming bed and breakfasts to large resorts with fantastic facilities and large apartment blocks. Whitsunday Islands accommodation caters for families, couples, singles and groups with options for every budget. From luxurious resorts to secluded getaways and island escapes, the Whitsundays have something for everyone. A selection of accommodation can be found on Hamilton Island. 3-5 star resorts compliment holiday homes and apartments. Daydream Island is ideal for families and couples with a day spa and kids club just some of the many facilities. There's no better way to experience the beauty of the Great Barrier Reef than with a cruising or sailing adventure. Whitsunday holidays can be as relaxing or as adventurous as you like. Enjoy this stunning natural wonder at your own pace and unwind on the beach with a swim in the crystal waters and delight in the breathtaking views of explore the 74 islands with a range of land, sea and air tours and activities. Glide through the calm waters of the Proserpine River on a Crocodile Safari, take in the amazing heart-shaped island with a scenic flight or enjoy the Whitsunday's favourite past time and cruise the sheltered waters on a luxury yacht, motor cruiser or catamaran. Drop anchor and explore the region top to bottom by snorkelling the pristine waters. The Whitsundays are a popular holiday destination with the Great Barrier Reef on one coast and Airlie Beach on the other. A great way to experience the amazing wonders that await at the Whitsunday Islands is with a holiday package to get more bang for your buck. Packages can include accommodation, meals, transfers, flights, tours and more! Choose from an existing package or speak to one of our experienced consultants to customise a package just for you. 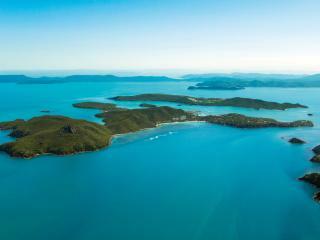 The Whitsunday Islands were formed more than 100 million years ago after volcanic activity formed mountainous terrain that remained connected to the mainland coast. After the last ice age (approximately 30,000 to 50,000 years ago) the mountains were partially covered by the rising sea creating the network of islands we see today. Humpback Whales pass through the waters between July and September during their annual migration. Yachties generally report average wind speeds of between 0-15 knots. A stunning group of islands off the Queensland coast, the Whitsundays are the ideal holiday destination to see on the water. There's no better way to experience the beauty of the Whitsundays and Great Barrier Reef than with a sailing adventure. Whether cruising on a fast-paced catamaran, enjoying the unique opportunity to sail a traditional tall ship, relaxing with a luxury sailing experience and even learning to sail, there's a Whitsundays cruising and sailing adventure for all skill levels. Explore this amazing part of the world and discover the beauty of islands like Long, Hamilton, Hayman and Daydream with a short sailing trip or skipper your own yacht and explore at your own leisurely pace. See the range of Whitsunday Sailing Vessels.